Kidizen, a mobile app in the secondhand-market for kids’ space, aims to create a Mom’s economy where individuals are empowered both economically and socially through sharing. When James Reinhart started thredUP a number of years ago it was a site where parents could swap boxes of used children’s clothing – a practical solution for his own kids’ outgrown clothes. Since then thredUP has gone on to become a site where savvy shoppers aka “Badass-moms” can find upmarket one-of-a-kind accessories, everyday basics, and stylish clothing – for their kids as well as for themselves – at huge discounts. Now there’s a new kid on the secondhand market block – Kidizen – with a focus on kids’ clothes, toys, and accessories, which differs from marketplaces like ThredUp in that sales are not limited to high-end items. Users, most of whom are moms, have the flexibility to list lesser-quality clothing which can be posted as lots or individual pieces. Given the better potential for sales, many of the listings do tend to be mid- to high-end apparel, or even boutique clothing. Another major differentiator is that sellers get to keep 82% of their profits. The secondhand industry is gaining momentum with growth in the resale market expected to outpace all e-commerce and retail sectors over the next 10 years – with a $25 billion total resale market being predicted by 2025. Enter Kidizen. With more than 100 percent year-over-year growth and a quarter of a million registered users across the U.S., the Minneapolis-based company has just raised $3.2 million in Series A funding led by Chicago-based Origin Ventures. Also participating in the round were Royal Street Ventures, Corigin Ventures, and MergeLane, along with prior investors Sofia Fund and Gopher Angels. Brent Hill, a partner at Origin Ventures, and Laura Brady, a partner at Royal Street Ventures, will join the company’s board of directors. Kidizen is positioned as a mobile marketplace run by moms for moms. 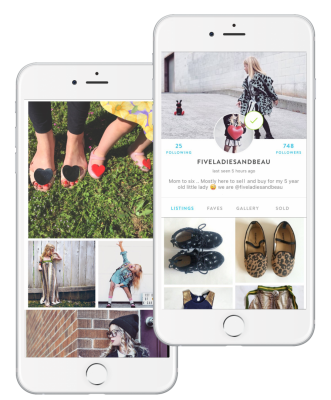 It connects moms and allows them to shop, sell, and share their kids’ style. Think Etsy meets Facebook for moms – with an Instagram-like interface in which the use of an aqua blue font for user names adds to the perception of white space and design appeal. Founded in February 2014, Kidizen is run by three parents and co-founders: Mary Fallon, Dori Graff, and CEO Dug Nichols. The idea emerged from Fallon’s and Graff’s previous platform, Itizen, launched in 2010, which tracked the stories attached to collectible items as they changed hands. Turns out that folks were more interested in selling than tracking – which is how Kidizen came to be. 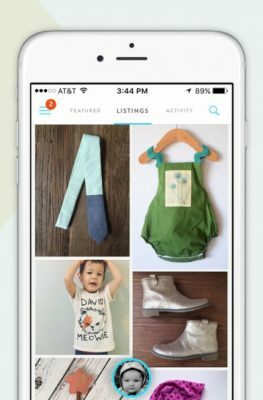 The mobile app provides a storefront for moms where they can earn money as well as find the latest styles for their kids. 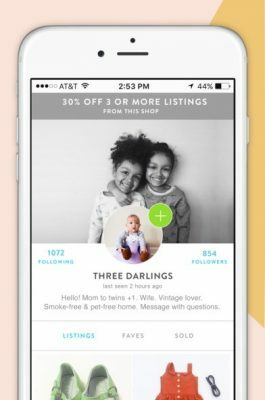 Making a listing as easy as taking a snap, while the social aspect of the app provides a community that connects moms with other moms through shared experiences. 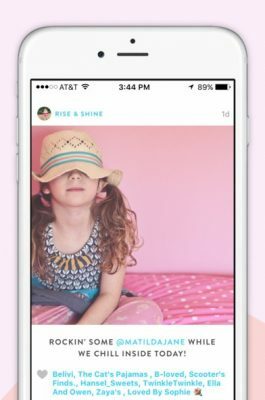 The online community / social network aspect of Kidizen is another differentiator from other secondhand marketplaces, particularly the “Gallery” feature which lets moms post photos of their kids’ style. The feature was added about two years ago and has become a core part of the app. Filled with lifestyle photography the feel of scrolling through the gallery is very like Instagram. Like Instagram, the photos shared in Kidizen can be pushed out to other social networks, and other users can comment on the photos, adding to the social aspect of the app. Hashtagging is popular with tags added by moms to both their own photos and listings as well as those belonging to other users. Hashtags under #Threads when I browsed were #hipster (my personal fave), #boho (Aww…), #nwt (had to Google, then #smh), #winter and #outerwear. “Basically, they’re creating what are like these curated collections through the hashtag…It’s in its infancy, but what we’re seeing that this is really a self-expression platform that’s both about the stuff and the style and inspiration,” said Nichols. It’s dead easy to #addathread with helpful suggestions given, like #brooklynbabes and #giveaways. The community element is said to be why the app is seeing high repeat usage – 88 percent of all sessions are said to be daily repeat users, and 55 percent are hourly repeats. In addition, 80 percent of purchases are coming from repeat customers, the company says. Word-of-mouth seems to be driving growth. “We see 70 percent organic user acquisition monthly. Most come with a need: buy or sell, and they stay because of the community engagement,” said Nichols. The marketplace is also growing to include more than just individual moms and power sellers, and now includes a small number of users who run boutique clothing shops similar to those found on Etsy. The funding will be used to add more features to the service, including those that allow for more curation, sharing, and self-expression, but the specifics of this are being kept under wraps at present. A future iteration will take on Facebook Groups by introducing a local selling component. The funding will also allow the Minneapolis-based company to grow its team of five to 15, refresh its apps and eventually expand the service to the web. The app was very easy to install and intuitive to use. As mentioned before, the use of the aqua blue font adds to the perception of white space and gives a clean feel to the design. The lifestyle photos are a delight. It is easy to see how word-of-mouth is driving organic growth. You can check out Kidizen on both Google Play and the App Store and become part of the community. I think the fact that each use is given a storefront to work with is just amazing. That is a major step in the right direction and takes a lot of the work away from the user to create their own. I think this is a home run of an app if you ask me. The stats for this app are pretty impressive. When you have that many people coming back for more each day, that is pretty good. I am willing to give it a try, I just hope there are plenty of users in my area to connect with. We all know that resale is a HUGE business. So many young families rely on things like this. If I could cruise around an app, rather than load the kids up to go shopping at a second hand store, I would take that option every day of the week! Pretty rad for moms. This one app brings a couple of different apps together. While connecting moms, they can also get rid of the clothes the children are growing out of on a regular basis. Great idea!